Let me say right out and up front that I'm a big fan of Tim's books and dvd's. He has some of the best books on the subjects of metalsmithing. That said this DVD is going to be another cornerstone in metalsmithing. Whether you are into jewelry, small sculpture, large sculpture or other metal folding, shaping work that requires patina's. Or just if you are interested in patina's or patination of your work. This is a great beginners,basic teaching aid. It is just what it says on the title and sub title. This uses readily available kitchen chemicals, and household products. He does digress into a few store bought liquid solutions such as gun blue and Jax brand green patina liquid. What is great about the DVD are the high production standards, as far as sound, and picture quality are. You can see everything, hear everything and there are plenty of closeups of the finished patinas. Along with the formulas of the patina mixes on screen. It is in his laid back, relaxed style he covers some things that could be called patination outside the box. When he is talking about the use of resists, and coffee grounds in a buried patina. There are printable pages of instructions (PDF) format along with the video content. Make no mistake this isn't a chemistry course, or a course in using the more exotic chemicals to create repeatable patina's on hundreds of duplicate pieces. It is a basic, small scale patina's that can be scaled up for larger work. Using safe (which is a realitive term when talking about vinegar, table salt, ammonia and copper sulphate) solutions found around the home. 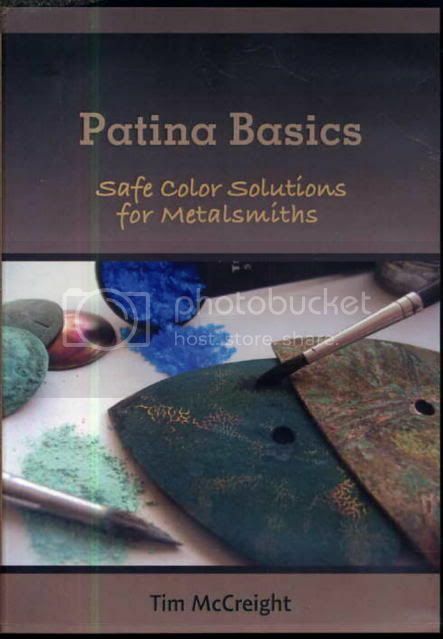 If you are unsure about some of the other materials for patina's for silver,brass, copper, and bronze. With a little practice and experimentation. I think you will be happy with this DVD and the results.